As a society we have become dependent on satellite communications, but satellites fail with alarming frequency. Before the advent of satellites, long distance communications were carried out with high frequency (HF) radio transmissions. This lesson examines the factors that control long-distance radio communications, with an emphasis on refraction in the ionosphere, frequency selection, and the effects of solar radiation. Very nice, enjoyed the content and quiz. This was a good refresher for me since it has been many years since I was NCOIC of the Solar Observing Section of AESC at the Cheyenne Mountain Complex. It was good to refresh my memories. Also a good short course or introduction to Ionospheric Physics. Would refer others to visit the Space Weather modules that COMET has produced. Thanks! Tough stuff for a guy like myself, but enjoyed the lesson! some is confusing but the videos are short enough I can play them again and usually understand enough. This course greatly increased my knowledge of solar / space weather phenomena. This lesson was way over my head, never used any of this information before. Was very informative. It would be nice to have transcripts or .pfd files for future reference. A good basic lesson in HF wave propagation. Watch out for the questions where you have to provide four answers to get one right. Much of this information was new to me. My interest is piqued and I will be studying this more in depth. 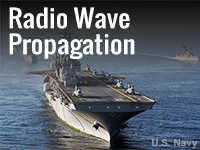 Great lesson on the science of radio wave propagation. Great information for HF, has a lot of information that's in the General Exam. Good for every ham operator. While every thing wants to be super high-tech, we will still need Radio communications in the future, at least for National Defense applications and back-up when the next massive solar flare takes out a few satellites. interesting topic and very informal. As a radio operator and technician, this course enhanced greatly my understanding of HF radio operation, and helps me to better utilize space-based communication systems, as well. Highly recommend, but you may need to go through some sections more than once! Having all the FCC licenses I thought I knew this subject well, but this course taught me a lot. It coherently tied atmospheric propagation to solar radiation and radio transmission. Rather than approaching this subject piecemeal, which is how most books do it, this little course showed the connections between natural phenomena and communications across the HF and VHF spectrum and through the layers of the ionosphere. This worked well. I am a radio amateur and the theme of HF propagation is the most beautiful and interesting for me. The lesson greatly enhanced my overall understanding of propagation that will lead to better communications across the amateur radio bands and appropriate use of frequencies. Excellent overview. My only wish is that there were more depth on some of the topics. Will have to use the great references. Highly recommended, especially for amateur radio operators who may have recently obtained their license and those who are interested in adding to their understanding of the topic. Very useful explanations and visualizations. Some of the sections need to enumerate the content so it can be summariezed and used effectively and memorized properly. Once I was able to discern the start and stop portions of the lesson it made a great deal more sense. It was a good lesson. I am a new Radio Amateur who has been away from electronics/radio communications for 40 years. This gave a good understanding of the basics of Propagation, clearing up a few issues I was unsure of prior to this. Frequently had to reverse and pause in order to read diagram. I didn't like the use of archaic units (miles) when quizing on height of layers. Very good graphics. Information too quick at times. While I have a ham radio and physics background, I learned quite a bit by taking this course. The course pulls much information that I have been exposed to into a cohesive whole. It's very advantageous to everyone studying on atmosphere. Helped me to better understand the principles of propagation. Overall an excellent lesson. My personal preference would be for more material in a slideshow format and less in a video format, but this is not a big issue. Excellent course. Improved my understanding of propagation and will be put to use in my amateur radio operations. Good module about radio wave propagation. Explain the two principal ways in which electromagnetic (radio) energy travels from a transmitting antenna to a receiving antenna. Discuss the regular and irregular variations that affect the extent of ionization in the ionosphere. Describe the frequency selection consideration for HF propagation.